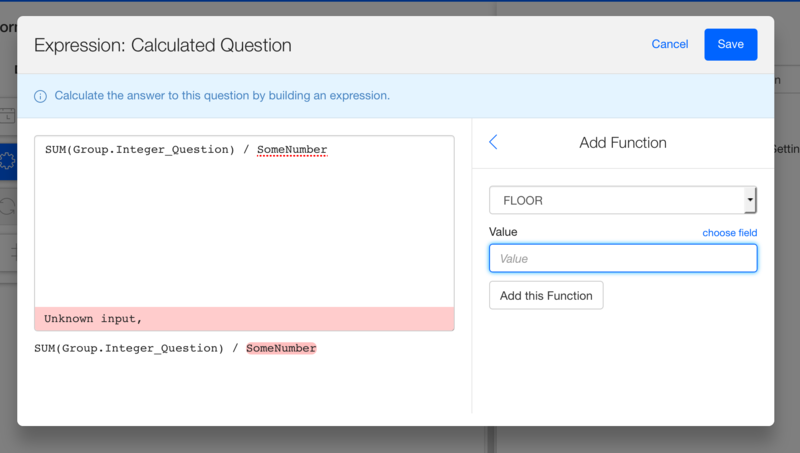 Calculated questions are like Excel functions or formulas and allow you to create logical expressions based on answers from your form. In this article we will go over writing expressions for calculated questions as well as providing information and examples of the available functions. 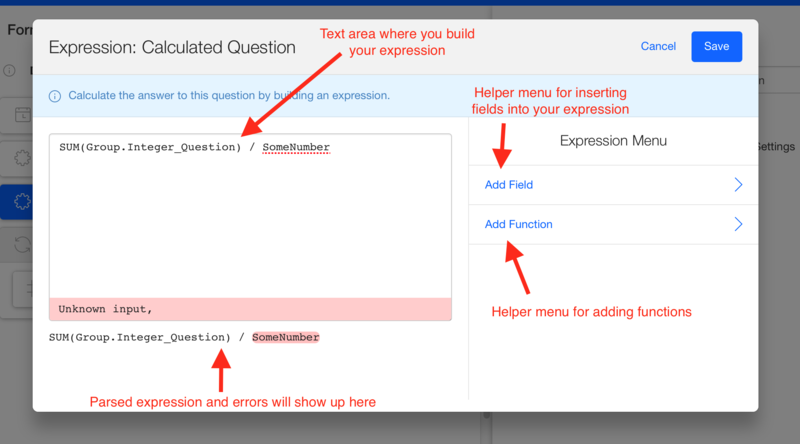 You build expressions by entering it into the main text area in the middle. The expressions are very similar to those you would write in Microsoft Excel. To make writing expressions easier you can use the "Add Field" and "Add Function" menus on the side. They will insert any Field or Function you select at the current cursor position in the main text area. You simply click on a field name on the right to add the field identifier to the main area. Add function works in a similar way except that you may need to fill in some values on the right first - You can click "choose field" to bring up the "Add field" box that to help set values. Once you have configured your selected function you click "Add this Function" to insert it into the main text area. - Field identifiers: The identifiers of the fields you want to use in the expression. When an identifier is used, the device will evaluate the current value of that field and use it in the expression. 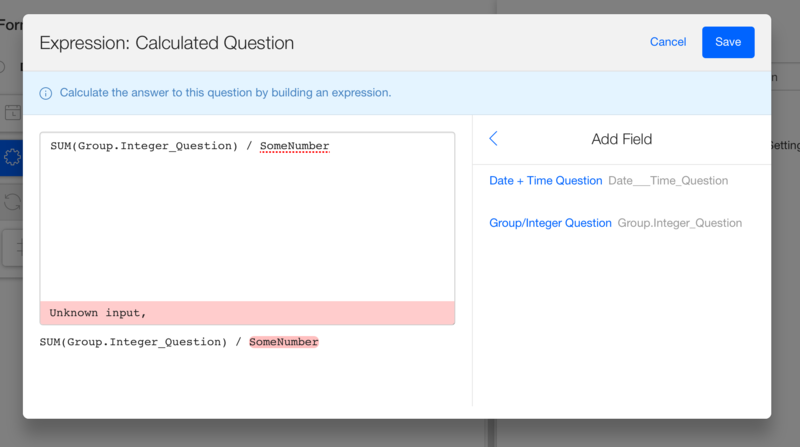 The value of the calculated question will update whenever a field used in the expression is updated. - Functions: The functions that you can use to perform various checks or calculations in the expression. We will give descriptions of the available functions later in this article. Putting these together you can map calculations or checks you want to perform into calculated questions. Important Note: Mathematical operators and functions will break when used on "Text" answers. Calculated and Select Questions are treated as Text answers - so to use them in mathematical functions you need to use the TO_NUMBER(). AND is used when you need to check more than one thing at a time and they all need to be true for the result to be true. AVERAGE is used to get the average of a collection of numbers passed in. CEIL rounds the passed in number up to the closest whole number. So CEIL(1.1) would return 2. CONCATENATE is used to combine text. You can pass in text questions as well as constant pieces of text. CONTAINS is used to determine whether a piece of text (a string) contains another piece of text. e.g. CONTAINS("the quick brown fox", "brown") would return true because "the quick brown fox" includes "brown"
CONTAINS("This is my text", "giraffe") would result in false. You can use questions as inputs as well to check what their answers contain. This is especially useful for multiple select questions. DEVICE_IDENTIFIER is used when you need to pass the identifier of the current device back as an answer. It can also be handy when passed to other functions such as LOOKUP when you want specific devices to get specific answers. FLOOR is used to round a decimal point number down to the closest whole number. So FLOOR(1.9) would return 1. The IF statement is used when you need to return different answers based on some check. It works in the same way that an Excel IF statement does. You construct the IF statement with 3 parts. The first parameter is the check, this is some expression that evaluates to true or false (e.g. NumberInput > 5). The device will evaluate the check and then continue on with evaluating either the second or third parameter passed in based on the result of the check. If the check is true then it will evaluate and return the second parameter - the True Branch. If the check returns false it will evaluate and return the False Branch. It doesn't matter what is in the True or False branch as long as they are valid expressions - so you can nest IF statements to get more than 2 outcomes. In this example the check is "Age > 65" - if this evaluates to true (the age is bigger than 65) then it will have a look at the True branch - which is just "Pensioner" and that will be the result. If the check evaluates to false (Age is less than 65) then it will go down the False Branch. In this case it would then evaluate the next IF as it is what we passed in. It would check Age again, this time against 20 and then either return the True branch "Adult" or the false one "Youngun". ISBLANK is used to check if the answer to a field is blank or not yet filled in. LENGTH returns the number of characters for the text you input. LOOKUP is used to fetch a value from one of your resources based on a "Key Value" from the form. LOOKUP functions need to be setup from the "Add Function" panel - it will walk you through selecting the various parameters for the function. You first select the Resource which should be an excel spreadsheet, then the Table (or worksheet) from that resource. Then you identify the Key and Value columns - the key column is the one you will search in and the value column is the one you want LOOKUP to pull the answer from. Finally you set the Key Value which is what you want to search for in the Key Column. Add the function - it will look like LOOKUP() with a bunch of identifiers for the parameters. LOWERCASE returns the input text but with all the capitals changed to their lower case versions. MAX returns the largest input. So you use it when you have a collection of numbers and want to find the biggest one. MIN returns the lowest value input. So you use it when you have a collection of numbers and want to find the one with the lowest value. MOD is used to find the remainder after you divide two numbers. So MOD(21,4) would return 1, because 21/4 is 5 but with 1 left over. NOTBLANK is used to check if the a field has an answer. OR is used when you need to check more than one thing at a time and any of them need to be true for the result to be true. POWER is used to work out mathematical exponents. So POWER(2,2) would return 4. It takes the Base and puts it to the power of the exponent. ROUND is used to round a number off to a certain number of decimal places. ROUND(3.4, 0) would return 3 as there are 0 decimal places specified. ROUND(3.5324, 2) would return 3.53. SUBSTRING is used to pull parts of a text answer out. You give the input, the position to start the result from and the length of the result and it will return that. SUBSTRING("this cool text", 6, 4) would return "cool"
SUM is used to add a set of numbers together. You can pass in a bunch of numbers and it will return the sum of the numbers. The other use of SUM is to add up numbers from a repeat group. To SUM over a repeat group you need the calculation question to be outside the group and then use the identifier of the question in the group you want to SUM. TO_NUMBER is used when you need to do some mathematical functions on Text answers that are actually numbers. This is very useful for answers coming from other calculated questions (the device does not know if these are really numbers) and for select questions (all answers are treated as text). UPPERCASE returns the input text but with all the lowercase characters converted to their uppercase equivalents. UPPERCASE("i am bob") returns "I AM BOB"
YEAR is used to get the year component from a date. You can input any Date/DateTime field, a Calculated Question that returns a Date or a function that returns a date like NOW(), DATE() or DATETIME(). It returns the year as a basic integer - YEAR(NOW()) would return the current year, 2016 at the time of writing this article. MONTH is used to get the month component from a date. You can input any Date/DateTime field, a Calculated Question that returns a Date or a function that returns a date like NOW(), DATE() or DATETIME(). It returns the month as a basic integer - 1 for January through to 12 for December. MONTH(NOW()) would return the current month, 6 at the time of writing this article. DAY is used to get the day component from a date. You can input any Date/DateTime field, a Calculated Question that returns a Date or a function that returns a date like NOW(), DATE() or DATETIME(). It returns the day as a basic integer - as the current day of the month 1->31 . DAY(NOW()) would return the current day, 9 at the time of writing this article. HOUR is used to get the hour component from a Time or DateTime. You can input any Time/DateTime field, a Calculated Question that returns a Time/DateTime or a function that returns a Time/DateTime like NOW() or DATETIME(). It returns the hour as a basic integer on the 24 hour clock 1 -> 24. HOUR(NOW()) would return the current hour, 14 at the time of writing this article. MINUTE is used to get the minute component from a Time or DateTime. You can input any Time/DateTime field, a Calculated Question that returns a Time/DateTime or a function that returns a Time/DateTime like NOW() or DATETIME(). It returns the minute as a basic integer in the hour 0 -> 60. MINUTE(NOW()) would return the current minute, 37 at the time of writing this article. SECOND is used to get the second component from a Time or DateTime. You can input any Time/DateTime field, a Calculated Question that returns a Time/DateTime or a function that returns a Time/DateTime like NOW() or DATETIME(). It returns the second as a basic integer on in the minute 0 -> 60. SECOND(NOW()) would return the current second, 25 at the time of writing this article. DATE is used to create a Date Object from the different date numbers. To use the function you pass in the year, month and day as numbers in that order. So DATE(2016,6,9) would create a Date Object for 2016/06/09. Date Objects are useful for comparing to Date Questions and for use with the Date Functions like ADDYEARS, ADDMONTHS, etc. TIME is used to create a Time Object from the different time numbers. To use the function you pass in the hour, minute and second as numbers in that order. So TIME(14,30,0) would create a Time Object for 2:30pm. Time Objects are useful for comparing to Time Questions and for use with the Time Functions like ADDHOURS, ADDMINUTES, etc. DATETIME is used to create a DateTime Object from the different date+time numbers. To use the function you pass in the year, month, day, hour, minute and second as numbers in that order. So DATETIME(2016, 6, 9, 14,30,0) would create a DateTime Object for 9 June 2016 at 2:30pm. DateTime Objects are useful for comparing to DateTime Questions and for use with the Date and Time Functions like ADDYEARS, ADDMONTHS, ADDHOURS, ADDMINUTES, etc. ADDYEARS is used to add a number of years to an existing Date / DateTime object. To use it you need to pass in a Date/DateTime Question or function and a integer number (directly or from a field). ADDMONTHS is used to add a number of months to an existing Date / DateTime object. To use it you need to pass in a Date/DateTime Question or function and a integer number (directly or from a field). ADDDAYS is used to add a number of days to an existing Date / DateTime object. To use it you need to pass in a Date/DateTime Question or function and a integer number (directly or from a field). ADDHOURS is used to add a number of hours to an existing Time / DateTime object. To use it you need to pass in a Time/DateTime Question or function and a integer number (directly or from a field). ADDMINUTES is used to add a number of minutes to an existing Time / DateTime object. To use it you need to pass in a Time/DateTime Question or function and a integer number (directly or from a field). ADDHOURS is used to add a number of seconds to an existing Time / DateTime object. To use it you need to pass in a Time/DateTime Question or function and a integer number (directly or from a field). NOW() returns the current date and time in a DateTime Object. You can use the result with the other DateTime or Component functions. YEAR(NOW()) would return the current year. TIMESTAMP() returns the timestamp off a question that has the timestamp enabled as a DateTime Object. GEOSTAMP() returns the Location off a question that has the geostamp enabled as a Location Object. If a calculated question returns a Location Object it looks like a Location Question. You can use the LATITUDE and LONGITUDE methods on a Location Object returned by GEOSTAMP. Here are some commonly used functions that can be a bit tricky. MOD(FLOOR((End_Time_Question - Start_Time_Question) / 60), 60), " minutes"